See who is the fairest of them all in Fairytale Legends: Mirror Mirror, the 3rd video slot in the Fairytale Legends series. Created by NetEnt, it’s a 5 reel, 243 ways to win video slot that comes with re-spins with transforming symbols, a trio of modifier extras plus pick me and free spin rounds. Play on your computer, laptop or mobile from between 10p and £100 per spin. 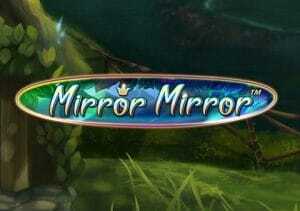 Like the other games in this series, there’s a cutesy feel to the design in Fairytale Legends: Mirror Mirror. A quaint forest forms the backdrop to the action. On the reels are silver A to 9 values alongside a lantern, crystal, a Princess and a Queen. The most rewarding symbol is the FL logo which will get you 150 coins for a 5-symbol combo. There are plenty of extras to get stuck into here. Mirror Re-Spin feature – look out for the mirror symbol which can hit on the middle reel only in the base game (plus on reels 1 and 2 in the bonus round). You’ll then see the mirror transform into either the Queen or the Princess. All other instances of the matching Princess or Queen are then frozen in place for the re-spin that follows. A final payout calculation is then made. Fairy Magic Spin feature – land this and you’ll see between 5 and 7 medium value symbols overlaid onto the reels. A new payout calculation is made with the extra symbols in position. Fairy Surprise feature – you could trigger this following any winless spin. 1 symbol, starting with the lowest value, transforms into the specially chosen symbol. These transformations continue until a winning combination is created. Fairy Mirror feature – the Mirror Re-Spin feature is awarded as the mirror symbol lands on the middle of reel 3. The game also comes with a trio of bonus features which are triggered by landing the scatter on reels 1, 3 and 5 on the same spin. Pick a treasure chest which will decide which of the 3 features you’ll play. Mining Bonus feature – this is a classic pick me round. Smash the crystals with the pickaxe to win prizes of between 5 and 50 times your bet. Free Spins feature – land this and you’ll receive 10 free spins. You can trigger the Mirror Re-Spins feature from here too. Coin Win feature – this does exactly what it says on the tin, awarding an instant prize equal to 15 times your total bet. Fairytale Legends: Mirror Mirror is a perfectly solid offering. The visuals are very well put together and there’s a decent range of extras. The bonuses aren’t dripping in originality but are steady enough. You can win 1,822 times your bet on each spin/free spin which is good. We’re not massive fans of the fairytale theme. If you are though, then there’s enough going on here to make Fairytale Legends: Mirror Mirror worth a spin. Saying that, I recommend you try Playtech’s Tinderbox Treasures which is better in my opinion.